Cruising down the open road on your motorcycle is such a freeing experience. But then you stop for lunch and realize how many calls you’ve missed on your excursion. You need something to help you take calls and communicate while you’re on your bike. 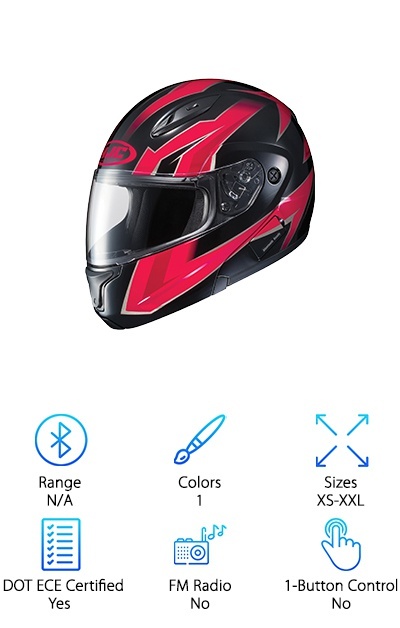 The best Bluetooth for motorcycle helmet is hard to find, but luckily, we’re here to help. We’ve assembled an awesome list of the best Bluetooth helmets on the market right now. Range - How far away can your Bluetooth reach. Many helmets offer the ability to communicate with other riders up to a certain range. These helmets also can communicate with your phone, and the range also tells you how far away your phone can be. Colors- You want your helmet to be an extension of your self-expression. Having a lot of color choices allows you to match your helmet to the rest of your gear. Some riders who have consulted the torc helmets review may prefer black. Sizes- Helmets should always be helmets first. This means that they provide protection for your head in case of an accident. A motorcycle helmet should fit your head snugly, so you want to make sure that your preferred helmet comes in your size. DOT ECE Certified - Another important safety feature, if you’re going to riding on the road you’ll need to have a DOT ECE Certified helmet. Be sure to look for this icon to know if the helmet of your choice meets or exceeds these safety standards. 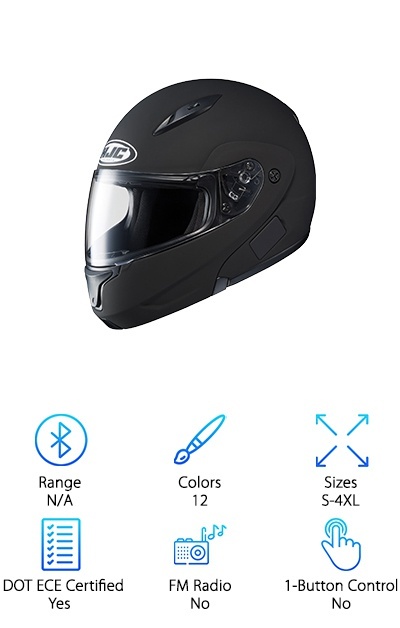 FM Radio (Yes, No)- If listening to music is the main reason you want a Bluetooth helmet, this is an important feature to look for. Listening to music can really heighten your riding experience, but some people prefer to just listen to the open road. One-Button Control - A one-button control can make controlling your Bluetooth connected device a breeze when riding. Choosing a one-button control allows you to focus less on changing the song or picking up a phone call and more on driving. Let’s get started on your search for the best motorcycle Bluetooth helmet out there. Our simple and easy to read buying guide can help you find a perfect helmet. We’ve looked at things like the best Bluetooth helmet speakers, controls, and durability. Our top and budget picks are great starting points for anyone looking for a helmet. We’ve also included eight more options, so you can be sure to cover all of your bases. 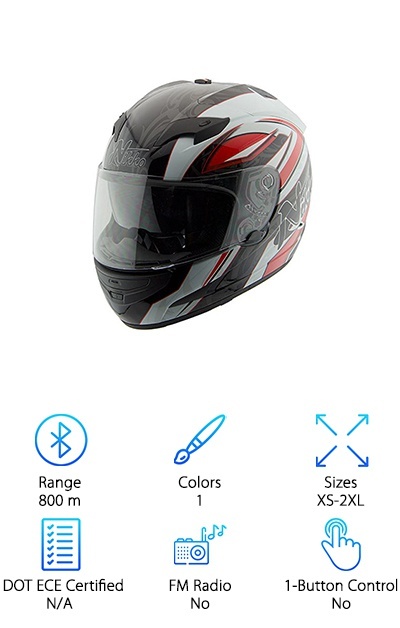 This Bluetooth helmet has it all. It comes in six colors that are sure to suit any rider's taste. The colors are- blue, gloss black, grey, matte black, red, and white. In this helmet, you’re sure to look smooth as you ride. This helmet also comes with Bluetooth intercom functionality. 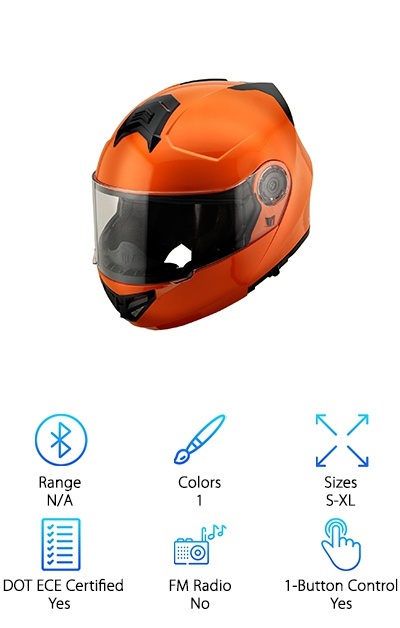 This allows you to communicate with two other riders connected with Bluetooth helmets, as long as they are within 500 meters of you. This helmet comes complete with Bluetooth 3.0, which is great for connecting to your phone, music player, or GPS. It comes with a simple one-button control that allows the user to completely control their phone or music player with the touch of a single button. This means no hassle or accidentally pressing the wrong button. The noise canceling microphone allows you to take calls and communicate with your buddies clearly, even when riding. The ventilation system helps you stay cool even on long rides or hot days. This helmet is a great choice for anyone who already has a Bluetooth headset that they love. This helmet is specifically designed to accommodate an existing Bluetooth system. It has an integrated recess for your Bluetooth headset. It also comes with an interior speaker cavity so that you can listen to your music and take your calls comfortably. The face shield provides 95% UV protection for people who ride for long periods of time or every day. The one handed chin bar/ face shield release is a great feature for people who don’t want to mess with their helmet too much when taking it off. It also comes with a quick slide tool-less replacement shield system. The advanced ventilation system can help you stay cool while you ride. The twelve colors make it a great fit for any style of rider. The colors range from pearl white to metallic red to the always classic matte black. A great choice for a budget rider. This helmet is a great choice for riders who want something simple and easy to handle. Its built-in Bluetooth system allows you to communicate with other riders. It also allows you to control your cell phone, music player, or GPS system. 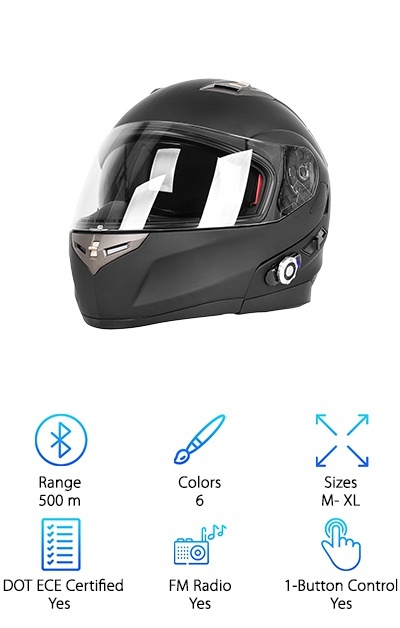 This helmet comes with a manual for both the helmet and the Bluetooth system, plus a Bluetooth battery and charger. This helmet pulls double duty as both a full face and an open-face helmet. It does this through a unique flip-up system. You can flip up the helmet with just one hand to convert it from full face to open face. This can be a great feature when you’re stuck at a stoplight or want to just pull over to enjoy the view. The Bluetooth controls are glove friendly. They are also waterproof. The visor is anti-scratch, meaning you won’t be staring at that one time you dropped your helmet every time you get on the bike. This helmet is a cool grey color. This is another great choice for a do-it-all helmet. One of the best motorcycle Bluetooth headset for music, this helmet comes with a great set of built-in speakers for listening to anything you like while riding. It comes with a built-in FM radio as well, allowing you to listen to anything you like while riding. This helmet really packs a punch as well. According to Freed-Con it is waterproof, sunproof, and is durable in any kind of weather. The dual visor is treated with a special anti-fog technology. You’ll never have to worry about whatever the crazy weather tries to throw at you when you’re wearing a helmet with weatherproof trappings. The liner inside is soft and comfortable for most users. It is also removable so it will be easy for you to clean after a hard day of riding. This helmet also includes a microphone for voice control commands while driving, so you don’t have to worry about messing with the button. This is a great choice for anyone who already owns the ChatterBox XBi2-H Bluetooth headset. This helmet is built specifically to accommodate that model of Bluetooth headset. It is optimized for the Chatterbox and speakers. This helmet has a single button chin bar and face shield release, for easy removal. The interior is where this helmet really shines though, it is antibacterial and removable. In addition to not worrying about cleaning it all the time, when you do need to clean it it is easy to do with a removable and washable interior padding. This can be really convenient if you’re in a hurry and itching to get back on the road. Don’t waste time manually cleaning your helmet's interior, just throw it in the wash with the rest of your riding clothes. The face shield offers 95% UV protection for those long sunny days. This helmet also offers quick slide shield removal, allowing you to easily change your shield. This helmet has a great look to it, with stand-out red, white, and grey stripes along the side. It comes in many different sizes, making it ideal for groups who want to be able to identify each other on the road. The com system included in this helmet is also optimized for groups. This helmet allows you to communicate with other riders via an intercom system. These systems allow you to communicate with your fellow riders as long as they are within 800 meters of you. Chat about where you’re going to stop for lunch, that truck that’s swerved lanes a few times, or just how you’re doing. This helmet also allows you to stream music directly into the speakers in the helmet. The helmet can withstand up to 74 mph, according to the seller, who also includes products by the people who makes bilt helmets. 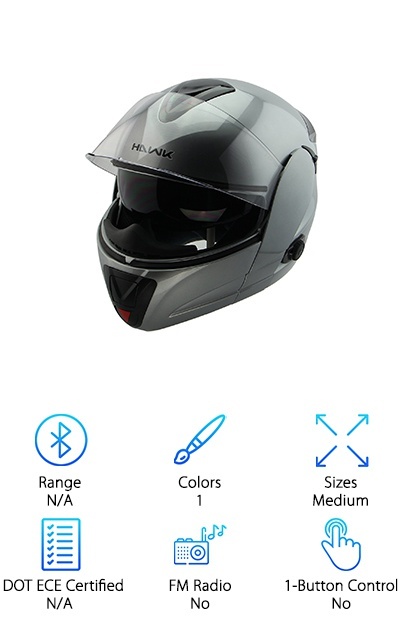 You can also route your GPS navigation through this helmet so you never have to take your eyes off the road. This helmet is a great choice for anyone who wants the best motorcycle half helmet. This helmet combines the best of both worlds- an open face helmet for those times when your face just needs to breathe a little bit, and a full face helmet for when you need protection while riding. One easy motion can make this helmet go from open to full, which is perfect for an especially hot day when you need a little bit of a breather at a red light. It’s also great for scenic drives on which you will be making frequent stops to take pictures or see the sights. An open face helmet won’t interfere with your ability to do any of these things, while remaining connected to your phone or music via the built-in Bluetooth. This helmet comes in six stylish colors- blue, gloss black, grey, matte black, red, and glossy white. The lightweight shell and advanced ventilation ensure you stay cool and comfortable. This may be a helmet with the best motorcycle helmet speakers. It includes some great speakers that can play anything- your best riding playlist, the new podcast everyone is raving about, even your important phone calls. The orange color makes you stand out on the road, so all your friends will know it's you speeding past them. The waterproof button panel means you can ride confidently even when it’s raining or snowing outside. The anti-scratch and anti-fog visor makes it possible to ride in those conditions comfortably as well. This helmet comes with a lot included too. It comes with its own carrying bag, a microphone, a separate boom microphone for open face helmets, a USB charging cable, some hook and loop strips with adhesive M3 tape, and a mounting bracket. The adjustable nylon chin strap ensures a secure fit every time. The flow-through ventilation system keeps you cool and comfortable, even on hot days or long rides. Possibly the best motorcycle helmet for women on our list, this modular flip up helmet comes in a wide range of sizes from XS-XXXLarge. This can accommodate any rider of any size. This helmet is lightweight and easy to wear. This makes it cool and comfortable for long rides. The ventilation system enables full front to back airflow. This allows the helmet to flush heat and humidity up and out of the helmet, keeping you cool, calm, and collected while riding. The moisture-wicking interior helps you stay that way. It is removable and comes out easily. It is washable, so you can easily keep your helmet clean and smelling nice, even when you use it every day. The face shield provides 95% UV protection, so you can be sure that you won’t be worrying about the sun’s rays while you’re riding. 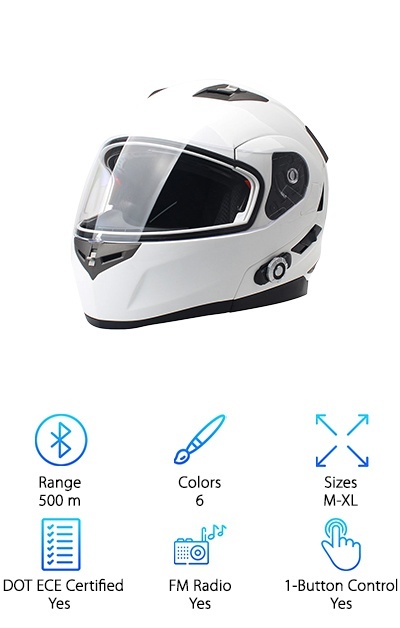 This helmet is perfect for people who already have a Bluetooth system they love because it is fully ready for a Bluetooth system to be integrated with it. This helmet is a great choice for people who want it all when they are riding. It includes a 1640 ft intercom range, so you can always stay in touch with your riding partners. The helmet is waterproof, so you can be confident riding in any kind of weather. The wide range of colors makes it a great choice for groups who want to be able to have the same level of quality in their helmets, maintain their individuality, and communicate with each other while on the road. This helmet comes in a matte and glossy black, as well as red, white, blue, and grey. It allows for hands-free calling while on the road, as well as intercom functionality for your fellow riders. You can control your music, GPS, phone, and intercom by voice commands, which keeps your hands on the handlebars and your eyes on the road. The anti-fog and anti scratch visor allows you to focus on the road without worrying about impediments on your line of sight.